Charlotte, N.C. (March 8, 2019) After much thought and deliberation, the Delhom Service League of the Mint Museum has decided to postpone its signature event, the Potters Market, until 2020, when the festival will be reimagined to be bigger and more robust than ever. One of the major changes in store: Rather than continue as an invitational, the 2020 Potters Market will be a juried show, a move that will bring even more diversity to the beloved affair. The event will also coincide with the 10th anniversary of the opening of Mint Museum Uptown. 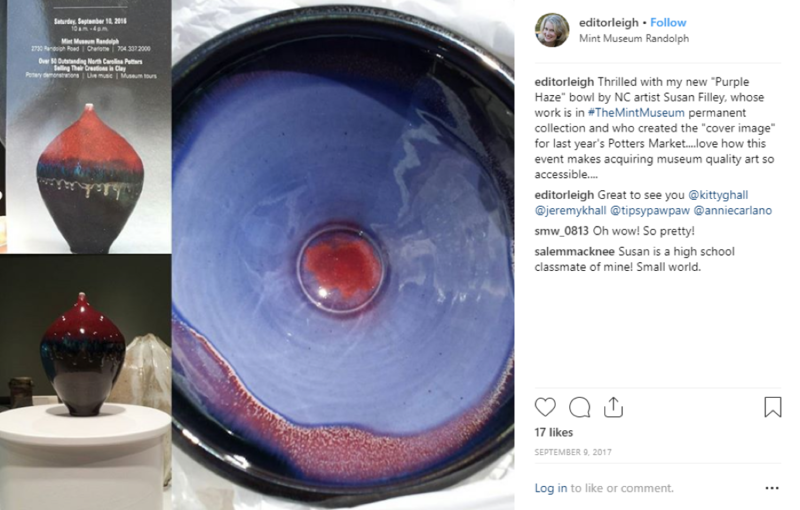 “This will be a very celebratory year for the museum, and our intention is to make the 2020 Potters Market a large part of that celebration,” says Sciabarrasi. Started in 2004, the annual Potters Market is beloved by ceramics collectors and pottery fans alike for the opportunity it provides to get to know dozens of the state’s best potters and shop the latest works in the rich tradition of North Carolina pottery. Wares range from mugs, teapots and jars to oversized pots, contemporary art pottery and sculptures. Funds raised by the festival help support acquisitions to The Mint Museum’s ceramics collection and help to promote interest in ceramic arts. 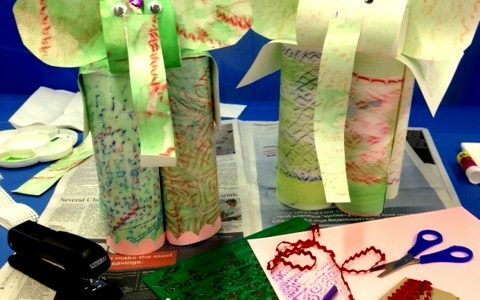 Delhom Service League hosts many public programs and hands on experiences throughout the year using these funds, relating to all types of ceramics, from ancient to contemporary. As the group works to reimagine the Potters Market, they hope enthusiasts will continue to engage with ceramics and clay by taking advantage of these programs. The Delhom Service League was founded by M. Mellany Delhom as an affiliate organization of The Mint Museum in 1975. The group—credited with boosting interest and funding for The Mint Museum’s vast ceramics collection—is comprised of a diverse group of artists, teachers, corporate leaders, writers, librarians, doctors, and collectors. Over the last 40 years the focus of the group has expanded, but the mission of the group is the same: to promote ceramic arts and education. Today the league presents nationally and internationally known speakers, and supports the Delhom-Gambrell Reference Library for the decorative arts. It has funded the acquisition of numerous objects for the Mint’s ceramics collection. Find Delhom Service League on Facebook, Instagram, and Twitter. See the Delhom Service League rack brochure with calendar. Museum-quality art: You may already be aware that North Carolina is one of the top destinations for pottery-making in the world, and that the Mint is a leading collector of this art form. It’s been a thrill to snag beautiful finds by potters whose work is featured prominently in the museum’s collection. And it’s affordable: You can find plenty of options under $100 by these museum-worthy artists – it’s one of the easiest ways to get started as an art collector. More than pots! My purchases have included a lamp, a wall clock, Christmas ornaments, candleholders, and much more – my home is filled with functional pieces I enjoy using daily. The most pottery ever: Each year the number of participating potters has increased – it used to hover around 50, but this year they’re tallying over 65. Make a day of it: Yes it appeals to shopaholics, but it’s also just fun to listen to the live music, catch a pottery-making demonstration, grab lunch, stroll the museum galleries, and people-watch. My daughter’s been going with me every year since she was 3 and she loves it too. 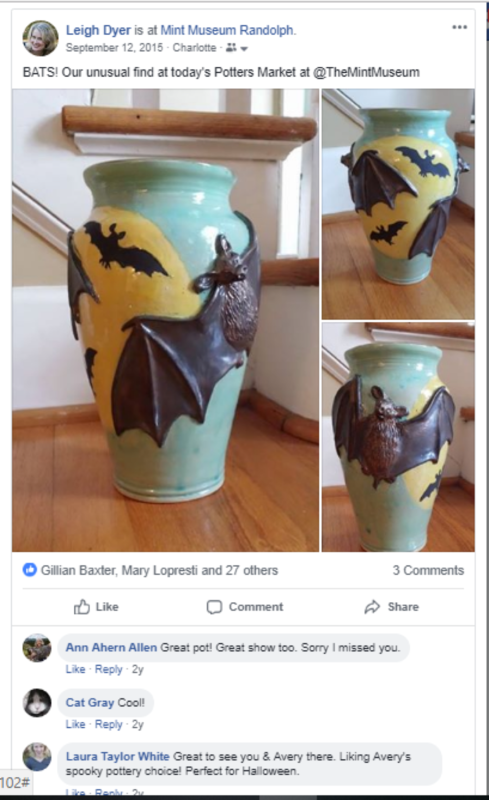 Enjoy the community: There are opportunities to meet and get to know the potters, and though you may find yourself competing with other shoppers to grab a one-of-a-kind piece before it’s gone, it’s always fun to compare purchases with each other later! Support the museum: Proceeds from the event support The Mint Museum’s collecting, scholarship, and public programming. Every year you’ll see placards on extraordinary works that have been selected as gifts from the Delhom Service League, organizers of the event, to join the Mint’s collection. Did we mention the beer? For the first time, the Delhom organizers have decided to include a “beer garden” with craft selections from Birdsong Brewing along with wine and snacks from Delectables by Holly. Sounds like a perfect addition to the day, and I can’t wait to check it out! Visit PottersMarketattheMint.com for more info and tickets! Collectors and pottery lovers will have access to the latest works by leaders in the rich tradition of North Carolina pottery when potters from across North Carolina and surrounding areas return to Mint Museum Randolph for the 14th annual Mint Museum Potters Market Invitational on Saturday, September 8, 2018. 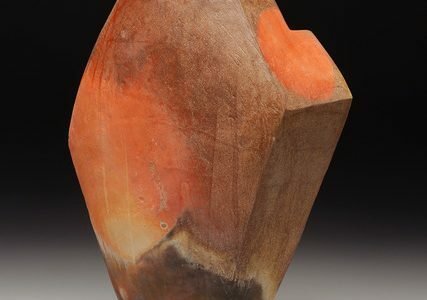 Sixty-six outstanding North Carolina potters have been invited to participate in this year’s event presented by the Delhom Service League, the ceramics affiliate of The Mint Museum, promoting ceramic arts and education. They’ll come from Seagrove, Western N.C., the Catawba Valley, and the Piedmont, and set up their booths in a tent on the lawn of the museum with remarkable works in clay – useful wares including mugs, teapots and jars, as well as oversized pots, contemporary art pottery, and sculptures. It’s like a shopping tour of the state’s best potteries all under one tent in one day. Attendees have the opportunity to get to know the potters as well as their work. This year’s show will introduce ten potters new to this event, as well as 12 potters who participated in prior years but were not present in 2017. Well-known participating potters include Donna Craven, Akira Satake, Ben Owen III, Eric Knoche, Mark Hewitt, and Cynthia Bringle. Every year, hundreds of pottery enthusiasts line up in advance of the opening to gain access to the day’s best treasures. The Delhom Service League has named Sarah Belk Gambrell Honorary Chairman of the 2018 Potters Market Invitational. Mrs. Gambrell was a Charter Member of the Delhom Service League and her strong support for the Delhom, The Mint Museum, and the Potters Market Invitational has been instrumental in each of these institutions’ success. The Delhom-Gambrell Library, named to honor Mrs. Gambrell, is one of the Mint’s many important resources, and is considered to be one of the top ceramics libraries in the country. Established in 1975, the Delhom Service League has grown from a few students of ceramics to over one hundred men and women who not only study the history of ceramics but also work to present educational programming, support the ceramics collection, add volumes to the Delhom-Gambrell Library, and provide funds for the purchase of objects to enhance the collection. Their most recent projects include funding the publication British Ceramics 1675-1825, a catalogue of the collection edited by Brian Gallagher, Curator of Decorative Arts, as well as support for the new installation of the European ceramics collection throughout Mint Museum Randolph. Additionally, there are folk musicians, pottery-making demonstrations, and food, and new this year, a beer garden serving local craft beer as well as wine and other beverages. Children 12 and under are admitted free of charge when accompanied by an adult. Individual sponsorships of $100 include Early Admission at 9:15 a.m. in advance of the general public. Special parking and continental breakfast are also included. Individual sponsorships of $150 also include attendance at the Meet the Potters Party being held Friday, September 7 from 6:30-9 p.m. Sponsors will enjoy dinner, music, and an opportunity to mingle with the potters and other pottery enthusiasts. Funds raised by Potters Market Invitational provide acquisitions of pottery and library materials for the Mint. Potters Market Invitational admission tickets and sponsorships are available at the door and in advance at PottersMarketattheMint.com , where you can also find detailed information on all the participating potters. For questions, please email info@PottersMarketattheMint.com or call 704.337.2000. Find Potters Market Invitational on Facebook, Instagram, Pinterest, and Twitter. CHARLOTTE, N.C. (August 10, 2017) – Back again on September 9th, ceramics collectors and pottery lovers will have access to the latest works by leaders in the rich tradition of North Carolina pottery. Fifty-two potters from across North Carolina, designated the Pottery State, return to Mint Museum Randolph for the 13th annual Mint Museum Potters Market Invitational. The event is presented by the Delhom Service League, the ceramics affiliate of The Mint Museum, which promotes ceramic arts and education. Artists will come from Seagrove, Western N.C., the Catawba Valley, and the Piedmont, to the tent on the lawn of the museum on Randolph Road with remarkable works in clay – functional wares including mugs, teapots and jars, as well as oversized pots, contemporary art pottery, and sculptures. It’s like a shopping tour of the state’s best pottery all under one tent in one day. Attendees will have the opportunity to get to know the potters as well as their work. Well-known participating potters include Akira Satake, Ben Owen III, Eric Knoche, and Julie Wiggins. In fact, 27 potters who will be at the event are included in the Mint’s ceramics collection, some of which can be seen on view in the installation Wares of the World: Asian Influence in Contemporary North Carolina Ceramics. It’s a fun-filled day with pottery and pottery demonstrations, food, and music. The $12 admission fee includes access to the potters’ tent from 10 a.m. to 4 p.m. as well as free admission to the museum and docent led gallery tours. Children 12 and under are admitted free of charge when accompanied by an adult. Individual sponsorships of $100 include Patron’s Early Admission Ticket at 9:15 a.m. in advance of the general public. Special parking and continental breakfast are also included. Individual sponsorships of $150 include attendance at the Meet the Potters Party being held Friday, September 8 from 6:30-9 p.m. Sponsors will enjoy dinner, music, and an opportunity to mingle with the potters and other pottery enthusiasts. Potters Market Invitational admission tickets and sponsorships are available at the door and in advance at https://www.mintmuseum.org/happenings/1281/potters-market-invitational-2017/ For questions, please email delhomserviceleague@gmail.com or call 704.337.2000. See our rack card and list of potters . Find Potters Market Invitational on Facebook, Instagram, Pinterest, and Twitter. Collectors and pottery lovers will have access to the latest works by leaders in the rich tradition of North Carolina pottery when potters from across North Carolina and surrounding areas return to Mint Museum Randolph for the 12th annual Mint Museum Potters Market Invitational on Saturday, September 10, 2016. Fifty outstanding North Carolina potters and two South Carolina potters have been invited to participate in this year’s event presented by the Delhom Service League, the ceramics affiliate of The Mint Museum, promoting ceramic arts and education. They’ll come from Seagrove, Western N.C., the Catawba Valley, and the Piedmont, and set up their booths in a tent on the lawn of the museum with remarkable works in clay – useful wares including mugs, teapots and jars, as well as over sized pots, contemporary art pottery, and sculptures. It’s like a shopping tour of the state’s best potteries all under one tent in one day. Attendees have the opportunity to get to know the potters as well as their work. The addition of Winton and Rosa Eugene, from Cowpens, S.C., to the lineup of potters broadens the regional focus while keeping the spotlight squarely on North Carolina pottery traditions. Other well-known participating potters include Akira Satake, Ben Owen III, Cristina Cordova, Eric Knoche, and Julie Wiggins. Every year, hundreds of pottery enthusiasts line up in advance of the opening to gain access to the day’s best treasures. The Delhom Service League dedicates the 2016 Potters Market Invitational to Daisy Wade Bridges (1932-2015), and is proud to honor her by establishing the Daisy Wade Bridges Purchase Prize from the Potters Market Invitational. Daisy Wade Bridges collected avidly and widely, and it is a certainty that without her dedicated support and enthusiasm there would not be a ceramics collection at The Mint Museum. 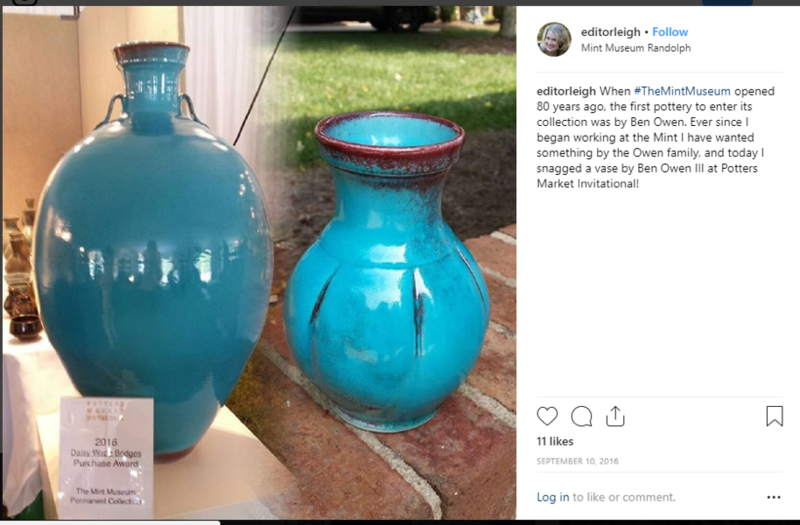 One of Bridges’ favorite projects was the Potters Market Invitational, and each year she generously donated to the museum several pieces of pottery from this event, making certain that the museum’s North Carolina pottery collection would be broadened and inclusive. Bridges was a major force in ensuring the prominent place The Mint Museum holds in the world of ceramics. The Delhom Service League is celebrating its 40th Birthday this year. Established in 1976, this unique organization has grown from a few students of ceramics to over one hundred men and women who not only study the history of ceramics but also work to present educational programming, support the ceramics collection, add volumes to the Delhom-Gambrell Library, and provide funds for the purchase of objects to enhance the collection. Their most recent projects include funding the publication British Ceramics 1675-1825, a catalogue of the collection edited by Brian Gallagher, Curator of Decorative Arts, as well as support for the new installation of the European ceramics collection throughout Mint Museum Randolph. Additionally, there are folk musicians, pottery-making demonstrations, and food. Children 12 and under are admitted free of charge when accompanied by an adult. Newly on view in the galleries will be the re-installation of the museum’s North Carolina pottery collection , which was guest curated by North Carolina potter David Stuempfle to reflect work by artists whose work is included in Potters Market Invitational. A free shuttle connects Mint Museum Randolph to Mint Museum Uptown from 11 a.m. to 4 p.m. so visitors may experience both locations. Individual sponsorships of $100 include Early Admission at 9:15 a.m. in advance of the general public. Special parking and continental breakfast are also included. Individual sponsorships of $150 also include attendance at the Meet the Potters Party being held Friday, September 9 from 6:30-9 p.m. Sponsors will enjoy dinner, music, and an opportunity to mingle with the potters and other pottery enthusiasts. Funds raised by Potters Market Invitational provide acquisitions of pottery and library materials for the Mint. Potters Market Invitational admission tickets and sponsorships are available at the door and in advance at mintmuseum.org/happenings/1026. For questions, please email delhomserviceleague@gmail.com or call 704.337.2000. See our rack card and list of potters. Find Potters Market Invitational on Facebook, Instagram, Pinterest, and Twitter.